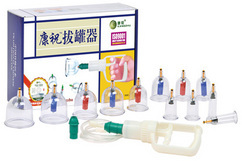 Kangzhu cupping sets are made with high standards and quality principles. The plastic cupping sets are durable, light weight, and easy to use with the hand gripped vacuum pump. Each Kangzhu cupping set is quality inspected at the manufacturer who is a ISO9001 quality management certified company. 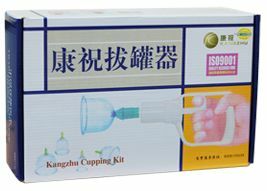 The Kangzhu 12-Cup cupping set is a excellent affordable cupping set for use in Chinese cupping therapy when the need for more cups are needed. 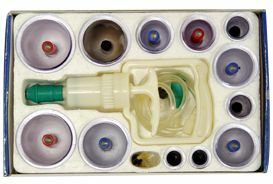 It incorporates suction cupping techniques and includes biomagnetic needles. The transparent cups let you adjust the pressure to the patients own comfort level and allows you to see the reddening progress of the treatment. Six different cup sizes let you treat any part of the body. Includes two of each size. 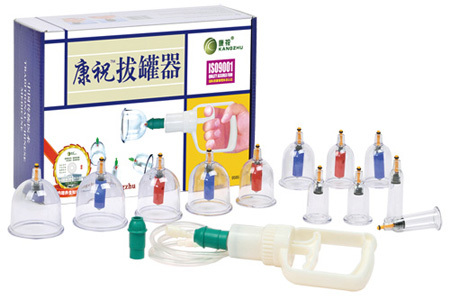 Vacuum suction cupping is easy and convenient to use without the need for fire eliminating dangers of burning the skin. Cups are designed with smooth curved edges for increased comfort and skin contact for an airtight seal. Durable transparent plastic cups allows for easy viewing of the treatment area and to view negative pressure and the reddening of the skin. Easy to use pressure valves allow you to effortlessly release pressure for cup removal (includes replacement valves). Biomagnetic points included increase efficacy of the treatment.